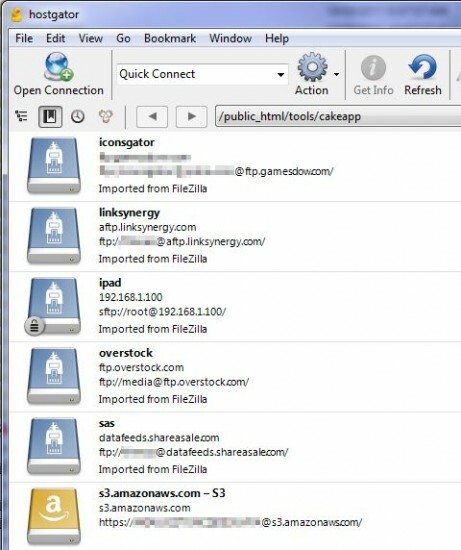 FTP clients are necessary for working with remote files. You can’t miss it if you have your own websites or managing clients’ websites. So far I’ve tested Filezilla, Cyberduck, WinSCP, CoreFTP LE and FireFTP. Here are my experience with each of them. Seriously popular no matter where I look. I’ve been a long time user and it has been working great. Connects to more than one ftp site and separated by tabs. However, one major issue that I have it is that it doesn’t autoupload after files (selected for editing) are saved. There’s an extra click on a messagebox asking “are you sure you want to upload”? before the file is uploaded. You might think that’s a small issue, but for someone who works with lots of files and love to press CTRL-S to save and test things out, this extra click is seriously bothersome and painful. All other FTP clients such as Cyberduck, WinSCP, CoreFTP and SmartFTP (not free though) have this function built in, why can’t Filezilla have it? Cyberduck is more then just a FTP client. It is an open source FTP and SFTP, WebDAV, Cloud Files, Google Docs, and Amazon S3 client for Mac OS X and Windows. It used to be for Mac only, thanks goodness it’s ported to Windows! The fact that it Works with files stored in cloud services such as dropbox, google docs, amazon s3 etc is exactly why myself and others love it so much. It also knows when there’s a newer version and ask if you would like to update the software (Filezilla has this too). Not as popular as it should be but works, looks and feel really similar to FileZilla. There are also tools built-in to open a remote terminal and SSH (with Putty) connection. Perhaps the most popular feature you’ll hear about is its ability to synchronize local directory with remote directory (Cyberduck has this too). Another popular ftp client. Not my cup of tea though after trying out Cyberduck and WinSCP. A popular firefox extension. Used it a lot back when Firefox was all the rage. Since I don’t use Firefox these days, I opt for desktop ftp clients. Please write a comment below if you find this post helpful in helping you choose a FTP client. Thanks for this article. I’ve used many of the clients mentioned, and think that WebDrive would be a good addition here. It supports WebDAV and S3, which many others do not, and also has a super easy to-use/clean interface.